This is hands down the most awesome NYE celebration going down ATX wide tonight! They’ve turned the Seaholm power plant into a virtual space station, and it’s the very last NYE bash at the old girl, so send her out right. NASA is DJSqueak E. Clean and DJ Zegon, who met in Sao Paulo and bonded over a mutual love and appreciation of rare brazilian soul and funk. They create crazy unique musical landscapes that mesh unlikely genres and artists together into a beautiful flow. Their debut album The Spirit of Apollo has a very impressive who’s who list of collaborations ranging from Nick of The Yeah Yeah Yeah’s to M.I.A to Ghostface Killah. 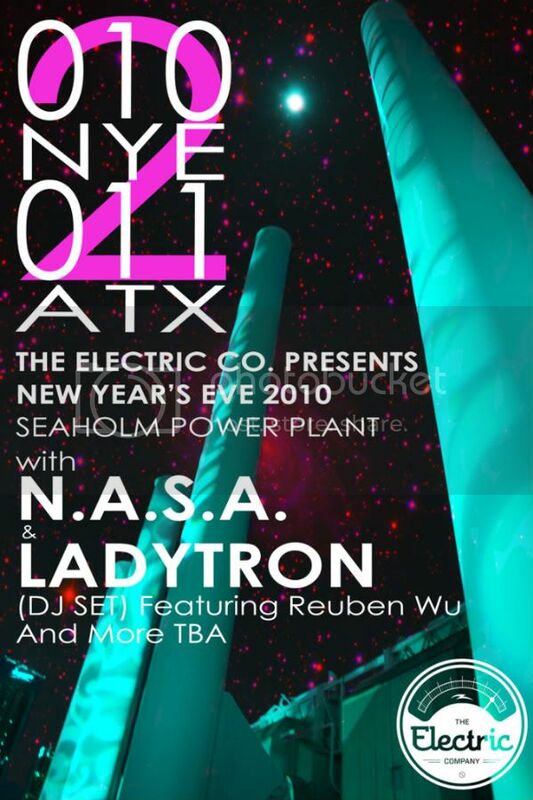 Rueben Wu is the original founding member of the amazingness that is electro-new wave group Ladytron. Infectious pop beats married faithfully to vintage sweat dripping analogue. I’m sure he’ll rep their sound well tonight. It says on the official flyer, ‘Rueben Wue & more TBA’ , so expect some pleasing surprises.